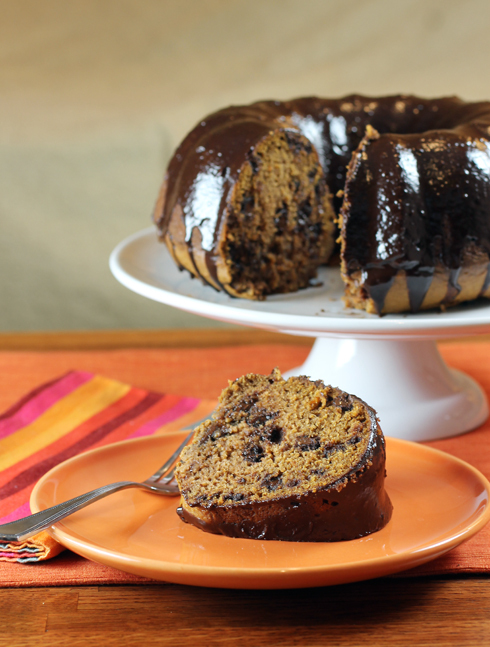 Holiday desserts don’t get more comforting than this cake, studded with plenty of chocolate chips. 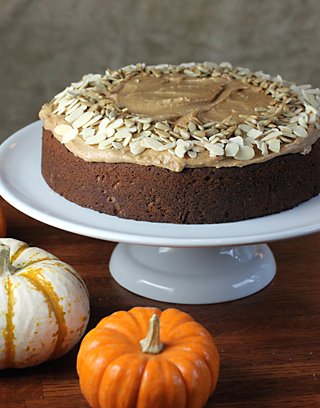 It bakes up moist not unlike pumpkin bread, and heady with autumn spices. The recipe says the cake will take about 40 to 50 minutes to bake. In my oven, it took 60 minutes. You’ll need chicory coffee for the Chocolate-Chicory sauce. 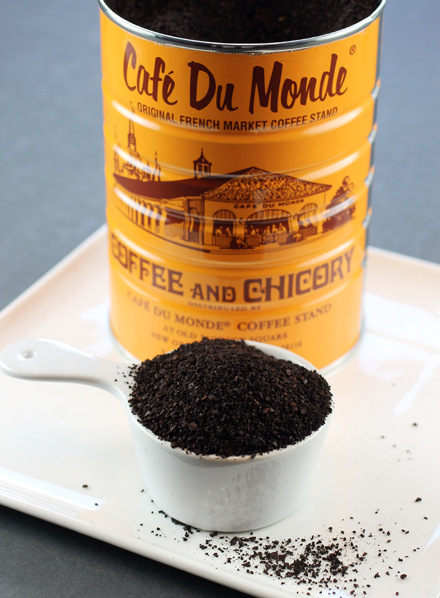 Just pick up a can of New Orleans’ Cafe du Monde chicory coffee at Cost Plus World Market and you’re good to go. 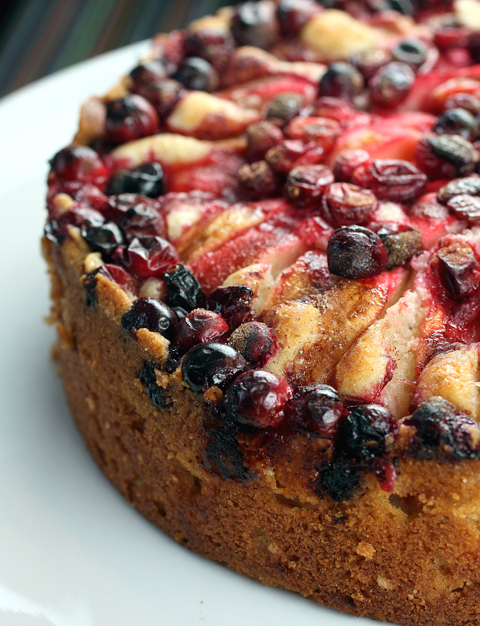 The sauce is optional, but the cake benefits from it, so do make it if you can. Chicory-laced coffee from New Orleans fabled Cafe du Monde. 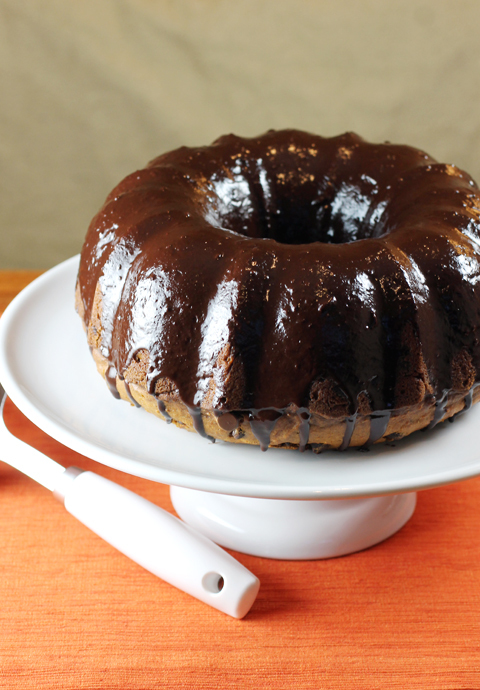 My only quibble is the original recipe for the sauce not only made way too much for the cake, but was of such a thin consistency that it was more like chocolate milk than a glaze. Had I really thought about it beforehand as I read the recipe, I would have realized that 2 cups of liquid to 10 ounces of chocolate just didn’t sound right. So below is the sauce recipe if I were to do it again. I cut the recipe in half and decreased the amount of cream even more to create a thicker consistency. If it’s still not to your liking, just remember that you can add more chocolate to thicken it or a tablespoon or more of cream to thin it out. 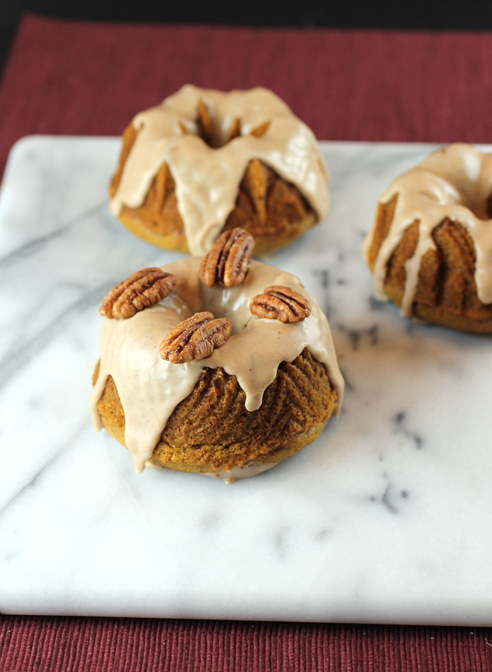 The slightly bitter taste of the glaze, coupled with its hint of chicory, really is an ideal compliment to the sweet potato cake. 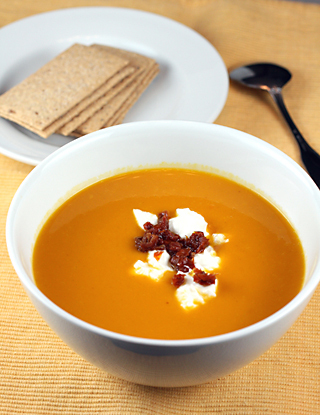 Plus, what a delicious way to get your dose of beta-carotene this holiday season. You can never have too many chocolate chips. Preheat oven to 350 degrees. Butter and flour a 12-cup Bundt pan. 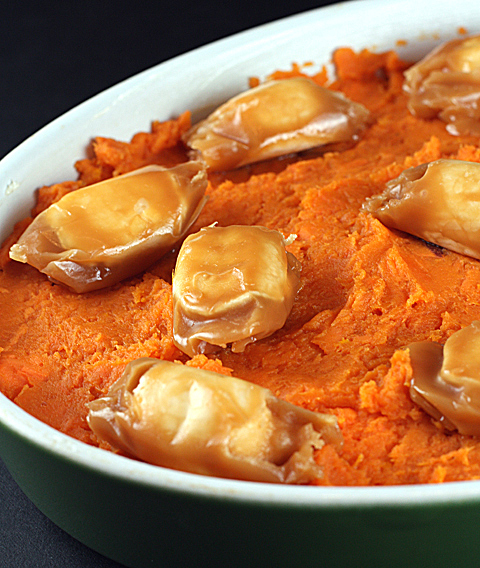 In a medium pot, cover the sweet potatoes with water. Bring to a boil, and cook until the potatoes are soft, about 15 minutes. Drain. 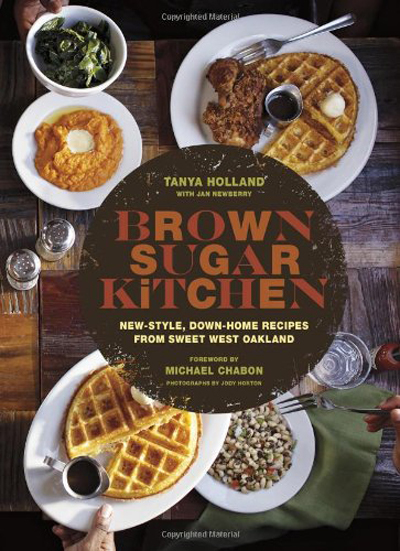 In a medium bowl, whisk together the flour, sugar, baking soda, cinnamon, allspice, nutmeg, ginger, and salt. Using a stand mixer fitted with the paddle attachment, beat the cooked sweet potatoes and eggs on medium speed until smooth. Add the melted butter and beat until combined. Reduce speed to low, add flour mixture, and mix just until combined. Remove the work bowl from the mixer and, with a wooden spoon, stir in the chocolate chips. Spoon the batter into the prepared Bundt pan. 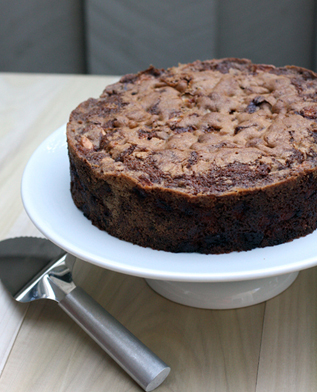 Bake until a toothpick or skewer inserted into the center of the cake comes out clean, 40 to 50 minutes. (Mine took 60 minutes, just fyi.) Transfer to a wire rack to let cool completely in the pan, about 1 hour. Loosen the cake from the pan using the tip of a dinner knife, then invert a rack over the pan and turn the cake out onto the rack. Let cool, then drizzle on the Chocolate-Chicory Sauce. Note: To store, cover with plastic wrap and leave at room temperature for up to 3 days. Put the chocolate in a medium heat-proof bowl. In a small saucepan, combine cream, coffee and cinnamon stick and bring to a simmer over medium heat. Pour the hot cream mixture over the chocolate. Let stand, undisturbed, for about 2 minutes. Discard cinnamon stick, then whisk until chocolate is completely melted and the mixture is blended and smooth. If mixture seems to thick, add a tablespoon more of cream if need be.